Planning for an outdoor kitchen is fairly straightforward if you think about what you want and need, and research a designer who can bring the skill to the table to make it happen. When you're researching a designer remember that good design does not cost it pays. The best design and build companies can deliver great design and quality installation, while walking you through the process - from design to budgeting, construction and permitting. ~ How many people for dining and entertaining and how often? ~ What are my grill options: gas, propane, charcoal or more than one? ~ How much prep work do I want to perform outside? ~ Do I want or need to have a sink area for dishes, washing hands etc.? 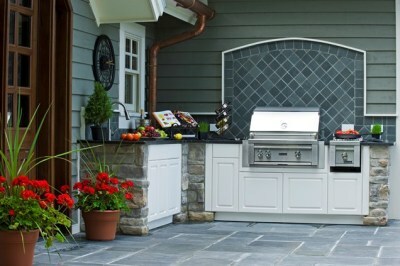 ~ Should the outdoor kitchen be a separate space from the house or should it be close to the house? ~ Does the safety of children need to be considered? ~ How much storage will I need and want? One of the most common errors with outdoor living spaces is making them too small. Intimate spaces that are well designed are not only functional but they are psychologically comfortable. However, a poorly designed small living area creates a space that is psychologically uncomfortable. This point brings us back to the idea that good design does not cost, it pays. outdoor kitchen with Atlantis cabinets. Here are a few things to think about when you are working through the design process. ~ The materials that are used should be durable. Do not use interior materials unless the space is beneath a roof and then verify that the material will withstand the fluctuations of temperatures. Landscaping in this part of Pennsylvania can be a challenge with temperature swings from the nineties during the summer to below zero in the winter. If your going to use tile make sure it has the thermal qualities needed. If you're thinking about wood make sure it is rot resistant. The tile and stone you choose should be impervious. ~ Outdoor lighting for the work surfaces is necessary if you like to entertain during the evening and for most of us this is the time to entertain. Some form of task lighting for the work surfaces should be considered in addition to lights for the general atmosphere. ~ Not planning for ventilation is possibly planning for smoke in your eyes and house. Outdoor kitchens that are under roof in a screened porch or other enclosed structure will need to have some mechanical ventilation. For kitchens that are in the open air you want to make sure the grill is far enough away or downwind from the house so that smoke and odors will not be a problem. ~ Make a connection to the interior. Using similar materials will help connect the space visually to the interior. Keep a clear circulation path from the interior to the outdoor kitchen.